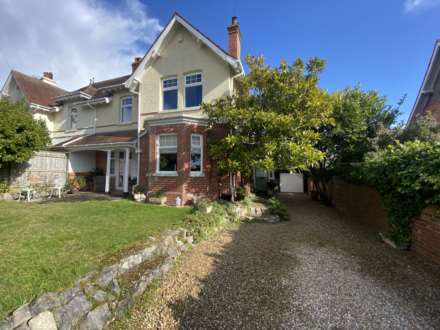 A very well presented 3 bedroom and 2 bathroom second floor purpose built flat with far reaching Sea and South Devon coastline views, situated in the popular `Avenues` area of Exmouth. This property is being offered with NO ONWARD CHAIN. This gas centrally heated ( from combi boiler) and uPVC double glazed property comprises of: living room, kitchen with integrated appliances, 3 bedrooms, master en - suite shower room and further bathroom. There is an allocated parking space to the front of the building and well kept communal gardens, and a single garage to the rear. This property benefits from a share of the freehold and a long lease, an appointment to view is strongly advised. This property is being offered with NO ONWARD CHAIN. Lifts and stairs leading to first floor. Night storage radiator. A bright and airy room with double glazed bay window, with blinds included, gaining far reaching Sea views. 3 Central heating radiators. Television point. Telephone point. Coving to ceiling. uPVC double glazed window. The kitchen is fitted with a matching range of floor and wall mounted cupboard and drawer storage units with roll edged work surfaces over and complementary wall tiling. Composite one and a half bowl single drainer sink unit with mixer tap. Built in 4 ring gas hob with double electric oven below and extractor hood above. Integrated `Zanussi` dishwasher, washer/ dryer and microwave oven. Space for fridge/ freezer. Cupboard housing gas fired combi boiler supplying the central heating and domestic hot water. Plinth electric heater. White suite comprising shower cubicle with thermostatically controlled shower unit, tiled to ceiling height with splash screen doors. Concealed WC. Vanity wash hand basin. Heated towel rail. Extractor fan. Dimplex electric heater. Window to rear with far reaching Sea and South Devon Coastline views. Central heating radiator. Built in triple wardrobes. Window to front. Central heating radiator. Obscure double glazed window. Modern fitted white suite comprising panelled bath with thermostaticaly controlled shower unit, shower rail and curtain. Complementary wall tiling to full height. Concealed WC. Vanity style wash hand basin, with cupboard beneath. Heated towel rail. Extractor fan. Electric wall heater. Fitted mirror with light and shaving socket over. Kincraig has mature, well stocked communal grounds that provide year round interest and colour. There is an allocated parking space to the front of the building, and visitors parking is close by within the grounds. This property has the benefit of a single garage with an up and over door, under eaves roof storage, power and light, that is situated at the rear of the building in a row of garages. The property is LEASEHOLD with approximately 130 years and an equal share of the Freehold. Service charges and buildings insurance are approximately £150 per calendar month to include window cleaning, upkeep of gardens, internal and external building maintenance and cleaning. These are draft particulars and are awaiting vendors verification. From our prominent Town Centre office, proceed up Rolle Street and then into Rolle Road. At the mini roundabout, proceed straight ahead into Douglas Avenue. Continue along Douglas Avenue, passing Maer Road and the Devoncourt Hotel and then take a left turning into Cranford Avenue. Kincraig can be found approximately 100 yards along the road on the left hand side.